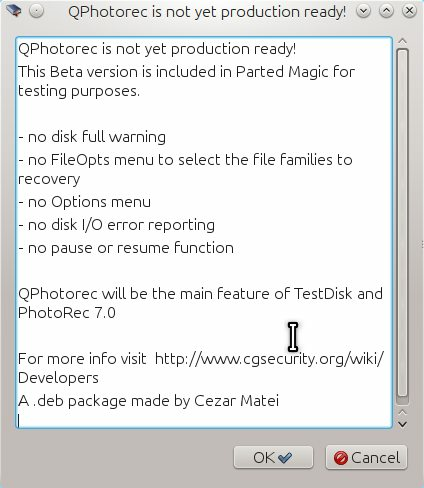 I've just downloaded QPhotoRec (v1.0) from SOURCEFORGE and after I installed it and ran it, I got a message informing me that it was a beta version and after clicking on 'OK', nothing happened, it just closed. Where can I download a working non-beta version of QPhotoRec as I prefer GUI over command line. I've already downloaded testdisk-7.0.linux26.tar.bz2 yesterday but have no idea what to do with it, how do I install it? and does it have the GUI version QPhotoRec in it as I could not see anywhere to download the GUI version! Anybody help me, I've had to upgrade to 16.04 and still can't find the GUI version of testdisk/photorec. Oh, BTW, sorry I didn't mention this earlier, I'm running Linux. Kubuntu 16.04. Kunbutu is not derivated from Fedora, you need to compile QPhotoRec as written previously.